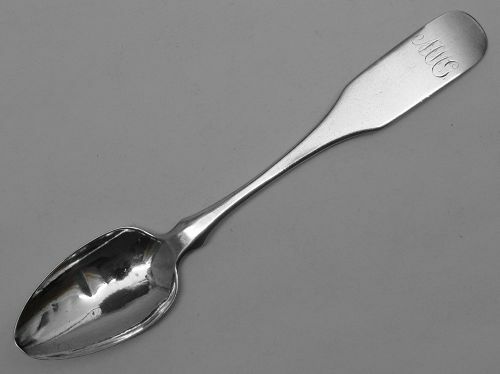 Offered is a nice coin silver tea spoon retailed by noted silversmith Samuel Richards of Philadelphia, and given the floret mark used by John Curry, probably manufactured by him. This piece has good clear marks and a period engraved "MMG" script monogram. It measures about 6 inches in length and weighs about 20 grams. Condition is fair, with some tip wear and a dent to the bowl, but no splits or repairs. All in all a good example of these marks!